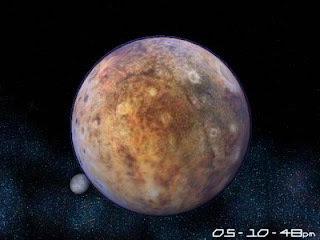 Pluto, (PLOO toh), is a dwarf planet that orbits far from the sun. It shares the region of its orbit, known as the Kuiper belt, with a collection of similar icy bodies called Kuiper belt objects (KBO’s). From its discovery in 1930, people widely considered Pluto to be the ninth planet of our solar system. However, because of its small size and irregular orbit, many astronomers questioned whether Pluto should be grouped with worlds like Earth and Jupiter. Pluto seemed to share more similarities with KBO’s. In 2006, this debate led the International Astronomical Union, the recognized authority in naming heavenly objects, to formally classify Pluto as a dwarf planet. Pluto cannot be seen without a telescope. The planet Pluto has yet to be visited by a spacecraft. It is hoped that the New Horizons craft will reach the planet on July 14, 2015. We do know that Pluto is a planet made up mostly of ice. Like its atmosphere, this icy surface is composed of Nitrogen, Methane and Carbon Monoxide. Its unusual 90,613-day orbit causes an anti-green house effect through freezing and sublimation.